Let me tell you something about sleeping on the streets of London; it is not nearly as fun as it sounds. Maybe one day a good friend of yours will propose such an idea, and you’ll think to yourself “oh what an experience that will be.” You’ll pack a bunch of snacks, throw on your warmest sweater and pay the extraneous price east coast rails offers for a last minute ticket down south and before you know it you’ll be getting off at Kings cross and boarding a bus to Leicester Square full of excitement. But the externalities of such an idea will quickly sneak up on you. Where does one pee? And sure, you’ve told yourself that you are a Canadian, you’ve experienced weather in the negative forties and snow to your knees and yet, you’ve never been this cold. This teeth clattering, feel it in your bones kind of cold. And as the night ranges on, from 1 am in the morning till 6 pm the next day you constantly remind yourself that you’re here for a reason. Ages ago, in the earliest stages of my blogging I outlined my bucket list. I listed 21 things I aimed to do before I turned 21 and I am glad to say I have officially been to a film premier. Ever heard of a minor film series known as “The Hobbit". I was in Leicester Square for its world premier two weeks ago. Now I’m going to be honest, I’ve never seen a Hobbit film. In fact I only ever watched the Lord of the Rings because my father was quite obsessed with it. But my friend is a major Tolkien fan and had expressed her interest in camping out in London to go to the premier. And, like I’ve said, I believed it would be an interesting experience so I offered to accompany her if she was serious in going. She was, apparently I was too. Now I’ve always known the LOTR series to be popular, but it wasn’t until I was surrounded my two thousand fans that I realized how popular it truly was. Leicester Square was over crowded, smelt of urine and absolutely freezing cold. And yet, when I was lucky enough to find myself pressed directly against the barrier making eye contact with Ian McKellen and having Jed Brophy laugh at a joke I made, I realized it was all worth it. I will say, Hobbit fans are very committed. 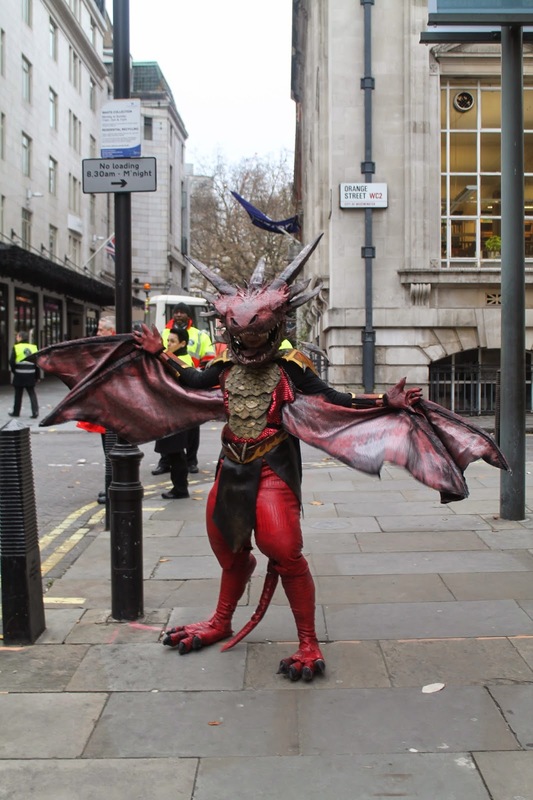 A home made Smaug costume. This is my good friend Diana having a nap and attempting to bare the cold. People really liked this poster, I didn't get it, I assume it has something to with the series but seeing as I'd never read the book nor seen the film. This was the a dictionary containing all the characters of the film series, my goal was to get the actors to sign on the character they play. This Jed Brophy, whom I mentioned before. I said I made him laugh. 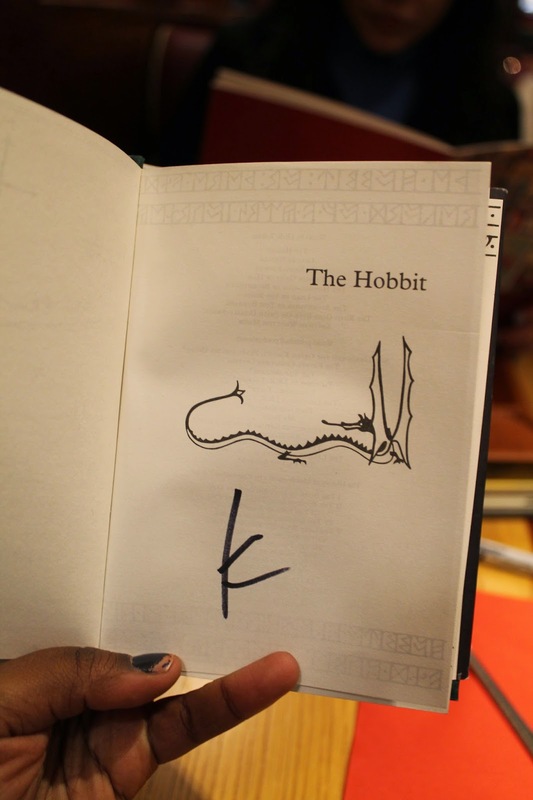 What happened was, I was getting him to sign the Tolkien Dictionary and he was a bit confused and asked to see the cover. He said he thought I'd asked him to sign the bible, I told him he could sign that too if he liked. This is Adam Brown, he's arguably the sweetest person I'd ever encountered. As I said before, I wanted him to sign on top of the character in which he played. He signed on the wrong spot and quickly realized it. He then apologized and I jokingly said "you could draw an arrow!" to which he obliged! Ian moved around a lot which made it difficult to get a good shot of him. But he did sign my book and he smiled at me and I loved it. I mean I'm not a fan of The LOTR series but I love X-Men! Ian McKellen's signature no big deal. Let me tell you something about sleeping on the streets of London; it can be exceptionally rewarding.